Interesting choice to spend some time swimming in L'Aquila. Is it not your very first time here? Tell us how it went using the Facebook comments beneath or contacting us directly! Piscina Comunale di L' Aquila «A. 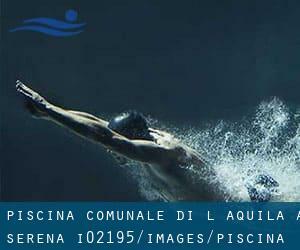 Serena» is only one of all the swimming pools Swimia is offering you, and its facts has been shared with us by a swimmer like you.Remember you are able to now promote Piscina Comunale di L' Aquila «A. Serena» by sharing this page with your friends, adding comments and linking to us. This sports center delivers 25 meters, 6 lanes, Indoors. Contact details for this Pool which include phone number and email address are number. If you believe that any in the knowledge is incorrect, please contact us. Assistance us be better day-by-day. Updated on 2019 Località Incoronata , Sulmona , ITALY (Postal Code: 67039). Swimmers like you reported 25 meters x 12.5 meters, 6 lanes, 1.9 meters depth, 1.9 meters depth, Indoors. Unfortunately we do not have the email address of this Pool, but we can give you the phone number. Località Tre Conche , Borgo Pineta , Avezzano , ITALY. Swimmers like you reported 25 meters x 17 meters, 8 lanes, Indoors. Unfortunately we do not have the email address of this Pool, but we can provide you with the phone number. via Fontana della Difesa , Pescasseroli , ITALY. This sports center provides 25 meters, Indoors. For this Pool, only phone number is number here.